Copyright: © 2018 Yazdani SO, et al. This is an open access article distributed under the Creative Commons Attribution License, which permits unrestricted use, distribution, and reproduction in any medium, provided the original work is properly cited. A 35-year-old female, known case of complete spinal cord injury, presented with cervical pain and neck deformity that interfere with her physiotherapy and occupational therapy. Two years before admission, she had a car accident which result in a complete quadriplegia. That time at another center, she underwent surgery to anterior cervical fixation of C6-C7 through insertion of cage and plate without corpectomy. Based on current radiologic images, spondyloptosis was detected at the C6-C7 with bilateral locked facet, due to hardware failure. A three approaches in one stage was performed to maintain cervical alignment that includes posterior, anterior and again posterior approach. With this manner, anterior fusion through corpectomy and insertion of expandable cage and plate as same as instrumental posterolateral fusion were done. After surgery, she was pain free and the alignment of cervical spine was maintained so she could come back to ordinary rehabilitation programs. Spondyloptosis, a rare subtype of spondylolisthesis, is defined as complete dislocation of a superior vertebral body on an inferior one in the coronal and sagittal plane that results from an injury [1-3]. Cervical spondyloptosis is an uncommon event and associated with a complete and irreversible neurological deficit . The usual therapy is reduction and stabilization of the fracture subluxation, typically with combined anterior and posterior fusion. In this article, we present a case of cervical spondyloptosis (C6 on C7) after failure of primary anterior fusion that was stabilized via three approach in one stage. A 35-year-old female, a known case of complete spinal cord injury (SCI), was admitted to neurosurgery department with complaint of neck and shoulder pain, kyphotic neck deformity. Two years ago, she had a car accident and she underwent anterior cervical fixation insertion of cage and plate without corpectomy. After a while, she presented with severe neck pain and kyphotic deformity as she could not perform her ordinary activity including physiotherapy and occupational therapy. After presentation to our neurosurgery department, CT revealed a spondyloptosis of C6 on C7 with bilateral facet lock (Figure 1A,B). Moreover, MRI was obtained to demonstrate the dislocation and assessment of disc and soft tissue. Figure 1: Spondyloptosis at the C6-C7 level with bilateral locked facet, due to hardware failure (A&B), Cervical fixation and maintaining alignment by combined posteroanterior (C) and posterior approach (D). After anesthesia, the head of patient fixed by three pin Mayfield headrest. At the first stage, the patient was placed at prone position, bilateral facetectomy at the level of C6 and C7 was performed. As second stage, the patient was placed at supine position. Before surgery, to check the possibility of recurrent laryngeal nerve injury through right anterior approach at the first operation, a laryngoscopy was performed in which the absence of paralysis of the vocal cord was proven. At this time, the patient underwent surgery through left side to prevent injury of the esophagus and vessels due to adhesions in the first surgery. After removing failed cage and plate, corpectomy of C6 and C7 was performed and expandable cage was inserted in the space and a plate was fixed on the cage at C5 and T1 (Figure 1C,D). All of these procedures performed under guidance of C-Arm. At the final stage, the patient was placed in prone position again, then posterior fusion was performed using lateral mass at the level of C4, C5 and C6 and pedicle screw at the level of C7 and T1. Through performing this stages, cervical alignment was maintained. After surgery, neck deformity was resolved and the patient was able to do her ordinary activities and she was pain free. Spondyloptosis, a rare subtype of spondylolisthesis is a complete coronal and sagittal translation of a superior vertebral body on an inferior one that occurs predominantly in the lumbar part due to motor vehicle accidents and diving injuries . Moreover, there are another causes of spondyloptosis including birth trauma , congenital cervical pedicles absence, corticated defect in the pars interarticularis , neurofibromatosis and aneurysmal bone cyst of cervical spine . The etiology of spondyloptosis in our patient was car accident. Spondyloptosis of the cervical spine is usually associated with spinal cord injury and presented with myelopathy, radiculopathy, cervical spasm and neck pain which can significantly affect the quality of life. Our patient as a known case of complete spinal cord injury, had kyphotic neck deformity and cervical pain due to failed anterior cervical fixation through cage and plate insertion without corpectomy. In order to relieve her pain and increased her quality of life, a surgical approach was done. There are different controversial surgical methods to provide a well-aligned, stable spine without causing a new neurological deficit. The most common method is simultaneously anterior and posterior approach (360 degree) at one stage or staged manner. We performed posterior, anterior and again posterior approach (540 degree) to manage the cervical spondyloptosis with regards to failure of primary fusion; we carried out three approach in one stage so there was no need for temporary fixation. 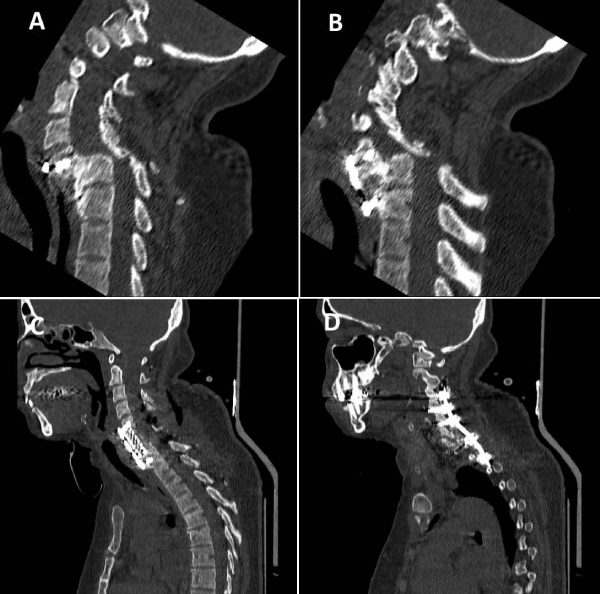 Shah et al., have indicated that uninstrumented ventral surgery alone might suffice in selected patients with cervical spondyloptosis . Also Srivastava et al., demonstrated that a limited anterior-only fusion at the spondyloptosis level can provide good long-term results with preservation of other motion segments . Menku et al., reported a case with successful one stage anterior, posterior and anterior correction and fusion-stabilization procedure to realigned the spine with extension from C4 to C7 without preoperative cervical traction . Similarly, Tumialan et al. represented a patient with traumatic cervical spondyloptosis at the C7-T1 level that underwent anterior and posterior instrumented stabilization. It seems that in cases of spondyloptosis, decision should be made individually, but anterior and posterior fixation (360 degree), will be a confident method to maintain long term alignment and permanent fusion. Informed consent was obtained from the patient to publish the report.